According to Greek legend, the fire was donated to the people by titan Prometheus. Of course, this is just a legend, but it is obvious that the mastery of fire has allowed mankind to become a completely different, more highly developed. Fire is a friend and helper, but when the fire gets out of control, it becomes a worst enemy. Fire destroys buildings and property; it threatens the health and lives of people. House after the fire is a horrible sight. However, everything can be recovered if carry out the work correctly and in a certain sequence. Actually redecorating is a final stage of fire damage repair. What should be done as soon as the fire is extinguished? Very often the apartment owners feel confused when they see a picture, which opens as soon as the fire-fighting ends. In the house can be seen broken glass, furniture, sometimes broken doors, carbon black and soot on the walls and ceiling. In this case, the main thing is do not panic and divide all the work of fire damage repair into the small steps that must be performed sequentially. First of all, the doors and windows should be opened to ventilate the premises. Aeration cannot completely remove the smell of burning. But it, at least, prevents odour to absorb deeper into the objects in the room. If the heating system at home or apartment become out of order as a result of a fire in the cold season, it is necessary to drain the water from pipes, to avoid breaking them. All furniture should be taken out of the apartment. If the furniture is damaged, it must be given in the repair, but in any case it should be removed from the premises after the fire to free up rooms for their purification. Directly after extinguishing of the fire in a room can be sharp debris and broken glass on the floor and on various subjects. Making the initial cleaning and taking out the furniture, it is necessary to exercise caution: wear shoes with thick soles, use sturdy tarpaulin mittens. Cleaning must necessarily be done to repair of fire damage. Beginning to clean, first of all it is necessary to remove from the premises burnt and damaged building materials (such as wallpaper, curtains). They can be damaged by fire, water or foam used to extinguish the fire. First, the damaged materials can hardly be used again. 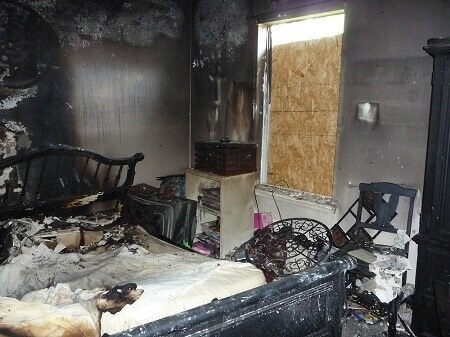 Secondly, they interfere to clean the rooms from soot and increase the smell of burning. The main part of work is cleaning of the ceiling and walls of premises. After the fire, the entire finishing layer (paint, plaster) must be removed together with soot and grime ingrained in it. It is impossible to separate the soot and remove it without damaging the plaster. Paint and plaster must be removed down to the capital base (brick, concrete). This work can be done manually with scrapers and spatulas, but the labour input of it is very high. Best of all, if cleaning the premises after the fire is carried out by specialists who have at their disposal the means of mechanization (for example, apparatus for sandblasting). It should be borne in mind that many combustion products are toxic, and their mixture with water or foam can create hazardous chemicals. Therefore, when cleaning it is necessary to use eye, respiratory system and skin protection. If you feel a burning smell, it means that in the air present the volatile combustion products. They not only have an unpleasant odour, but are harmful to health. Therefore, they must be completely removed. This is achieved by using professional methods of elimination the smell of burning. Soot can be absorbed deep into the pores of the concrete and to remain there after dry cleaning. These residues should be removed in order to completely eliminate the smell of burning. To delete them, professionals apply special reagents that are deposited on the walls using spray equipment. Tiny drops of reagents penetrate into the pores of the concrete and react with soot. As a result of chemical reactions occur soluble substances, which can then be removed with special solvents. When cleaning the premises after the fire is completely finished and the smell of burning and smoke is eliminated, you can begin the normal redecorating. It must begin with an applying deep penetration primer to the walls. The primer penetrates deeply into the pores of concrete or brick. Even if there were traces of combustion products, primer seals them in the pores of the building materials. After that you can put the plaster on the walls and ceiling, and then perform wallpapering. Of course, after the fire must be laid a new floor. In almost all cases, after a fire an electrical wiring needs to be replaced. If you change the electrical wiring, you must ensure the proper connection of all electrical appliances in the house and use the appropriate cable cross-section to avoid an overload. Overloading of electrical wiring is one of the most common causes of fires. In order to perform all these works with the appropriate quality, should not try to fulfil them on your own. It is better to invite experts who have the necessary skills and tools to repair of fire damage. Of course, fire is a great misfortune. It’s able to completely disrupt normal life or work in the office. But everything can be corrected, if properly carry out all the work on the restoration of the premises after the fire. 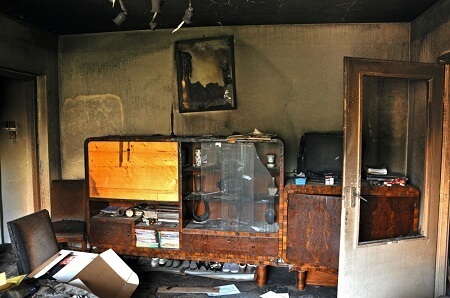 Fire damage repair is one of the areas of specialization of our company. Very often we have qualified personnel, experience, necessary materials and equipment to carry out the whole complex of restoration work after a fire. We are well aware of the difficulties facing people affected by the fire, and try to perform the work as expeditiously and carefully as possible, in order not to damage the property and household items which are not affected by the fire. And finally, we can take things for temporary storage of the affected home or office until recovery repair lasts. The right decision is to turn to professionals which can help you to overcome the effects of the fire.